As you all know, Hunter PR gave all the Star Wars media outlets high resolution images from the Collectors' Event Hasbro held in New York during the 2013 International Toy Fair. While most of the images seen during the presentation were included, the image with the Ewoks & Catapult set were not among them. The image was omitted because it isn't the final product. Hunter has stated that they will provide an image of this set once all the elements are finalized. 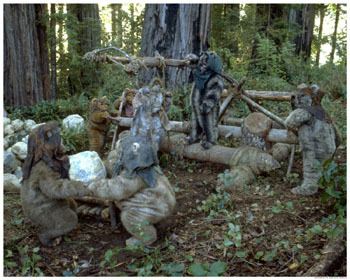 The absence of this image has created a stir in our forums, and many collectors have been trying to figure out who the two Ewoks are. We asked around and found out the figures are based on Chubbray and Stemzee. Sadly, google searching doesn't really provide images of these two warriors, at least not images we are confident enough to publish as fact. We do know, however, that the set was designed based on an Official Pix image. From what we remember from the presentation, this picture seems to be the one. We also found out that the Carbonite Han that will be packed in with The Empire Strikes Back Slave I will be based on the 2006 Saga Collection Han Solo figure. This time out, the Carbonite Block will be molded and painted silver, so the red glowing feature of the original will not be making a comeback. Interestingly enough, when the original Rise Of Boba Fett version was being developed, this was the Carbonite Han they used to design the cargo hold. When they were developing the Jar Jar block for last year's SDCC exclusive set, sculptor Dave Vennemeyer designed his sculpt to also fit in the same space. While no Bothans were truly harmed in the delivery of this message, one of them got a paper cut and he just won't stop whining about it.